NGU Photo: L to R: Dr. T. Walter Brashier; Dr. Jimmy Epting, NGU President; Christine Brashier; Keli Sewell, Vice President for Enrollment Services; Dr. Sam Isgett, Vice President for Graduate Studies. Tigerville, SC – North Greenville University now has a presence in the City of Greenville thanks to a commercial real estate gift from a local Upstate couple, Dr. T. Walter and Christine Brashier. On Thursday, the school held a dedication ceremony and ribbon cutting for the new Tim Brashier Center. Brashier family and friends along with city, county, and state officials were on hand for the announcement of the opening. In 2011, Brashier gifted NGU the former Steak and Ale restaurant building on North Pleasantburg Drive in Greenville. The building has been remodeled to house the school’s Master of Business Administration program which was residing in the T. Walter Brashier Graduate School in Greer and the admissions advisors for all the school’s graduate programs and College of Adult Professional Studies (CAPS). North Greenville trustees voted to name the location the Tim Brashier Center in memory of the couple’s son, Martin Timothy Brashier, who passed away in September of 2012. Tim earned his associate in science degree from North Greenville in 1979 and was active in the family businesses; developing residential real estate and running an aviation servicing company. Tim loved God, his church – Berea First Baptist Church in Greenville, his family, and was a favorite uncle to many nieces and nephews. Tim, however, was most notably known for this giving heart, just like his parents. “Life for Tim was never about Tim. It was about giving to others,” said his mom, Christine. “He was one of those that would give you the shirt off his back. He realized there was more to life than just taking,” said Christine. Because Tim was a businessman, he would have appreciated that the facility will be used to train future business leaders. He’d like the location because of its proximity to downtown Greenville and because he spent time building the apartments that sits adjacent to it. “North Greenville University has not only honored Tim’s memory, but also has honored us as his parents by naming this new satellite campus the ‘Tim Brashier Center,” Brashier said. 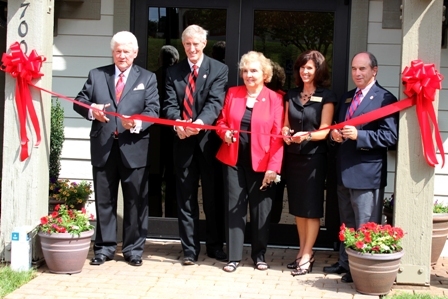 Brashier’s support of North Greenville University didn’t start in 2011, but has spanned four decades. His first contribution to the school was a downtown office building in the 1970s. Brashier has built a residence hall on the northern Greenville County campus, started an endowed scholarship, named the school’s graduate school, and his latest $3 million gift allowed the school to begin work on the new Legacy Building which will be a 5,000-seat Arena/Worship Center that will bear the name of the school’s president and first lady.